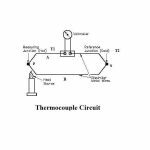 There are two thermocouples namely measuring thermocouple and balancing thermocouple. They forms a part of bridge at the input of DC amplifier. The same non linearity effect takes place in both the thermocouple, so this effect is compensated. 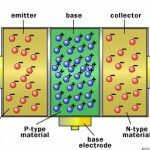 An input AC voltage to be measured is first amplified by using AC amplifiers, thus the smaller input voltages can be measured. To avoid any DC component in the measurement, a coupling capacitor is used at the input side. The output of AC amplifier is connected to the heating element of measuring thermocouple. This will generate the heating wave at this thermocouple. Now this thermocouple will generate the voltage proportional to the heating wave. This voltage generated by measuring thermocouple makes the bridge unbalanced. This voltage is amplified by the DC amplifier. The output current form DC amplifier is acting as a feedback current. This will create heating of balancing thermocouple. Now this balancing thermocouple will give the voltages proportional to the heating wave. 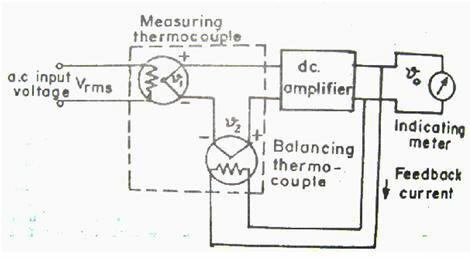 A stage will be reached at which output of measuring thermocouple becomes equal to the output of balancing thermocouple. At this point, the balancing of bridge circuit takes place. So the feedback current becomes equal to an input current. This current is now used to cause the movement of indicating meter.